Mimsy Were the Technocrats: As long as we keep talking about it, it’s technology. It’s very rare that I get really excited by software. The first time was probably for Ashton-Tate’s FullWrite, and that turned out to be a bust—it could create amazing one-page documents, but exceed about ten pages and the Macintosh slowed to a crawl. Hit fifty or sixty pages and you could go out to eat in the time it took to redraw the screen. Maybe ClarisWorks. Definitely iTunes. Even though it was a reskinned third-party product, it simplified the skin enough that I wasn’t asking “what is this software for?” and used it to listen to music again. I’ve been using Nisus Writer Pro 2.0 since last year. I started using Nisus at 1.0. If you’ve been paying attention to the Hacks and gaming tools section of my blog, you’ve seen the occasional Nisus script. But I didn’t buy Nisus 1.x because I could program it; I bought it because it made writing easier. It’s rare that its feature set gets in the way of writing as happens in other word processors (*cough* Microsoft Word *cough*). Getting to styles are a single click and they’re set up the same way as formatting the actual text: using styles to format text is just as easy as formatting the text directly, which means I’m no longer tempted to apply formatting to text outside of styles, only to rue it later when I need to change formatting throughout the document. If you’ve followed my occasional rant about word processors, you’ll know that the one thing that kept me from switching away from Word for a long time was its support for full-document outlines, where the document is the outline and the outline is the document. Nisus Writer Pro got “the document is the outline” in 1.0, and it got “the outline is the document” in 1.2—and it’s much easier to use than my copy of Word’s modal version1. 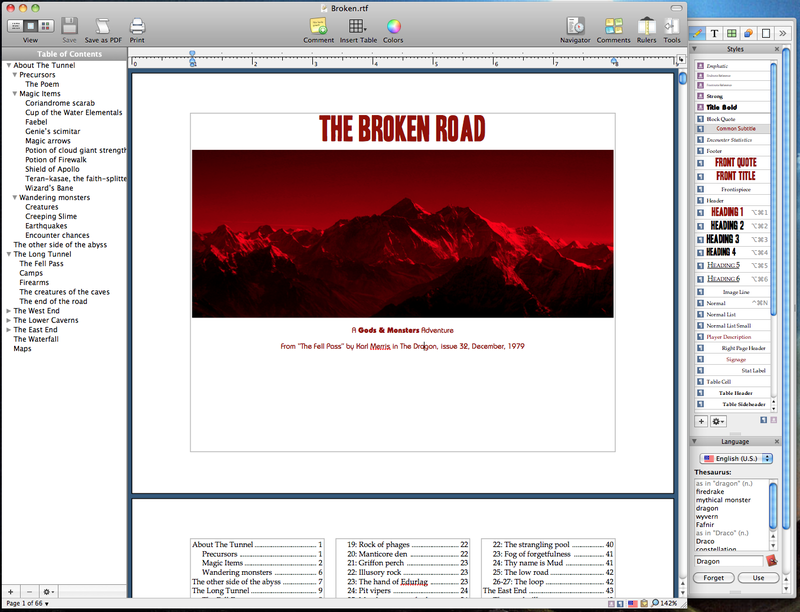 The outline appears as a navigation column to the left of the document window. When I convert a document from Word to Nisus, I like to take the raw text and reformat it using the strengths of Nisus, rather than just open the Word version in Nisus2. This lets me make sure that all of my formatting is handled with styles (in Word, accessing styles was annoying enough that sometimes I just didn’t bother), and it gives me a chance to proof-read the document again. Completely reformatting my 100-page Gods & Monsters rulebook from straight text to a fully-formatted version took just a few hours, and that was with beta-version crashes. Today it’s rock-solid, and the resulting PDF that I upload to my web site links to other web pages, links the table of contents, and generates PDF navigation based on the heading levels. This makes the document very easy to read in iBooks on the iPad3, and a lot more useful in general. Nisus uses “RTF” as its native format; this makes it very easy to send documents to people who use Word. For my personal writing this isn’t important, but at work it is, and it works fine—I’ve literally never had a problem with it. At version 2.0, Nisus adds floating objects, and they work in a typically well-designed manner. Draw the shape in and you’re done. If you need to adjust the defaults, it’s just a couple of obvious clicks. There are very few modal windows to block your work. The only ones I can recall off-hand are the obvious: Save As… and Open. Writing is seamless. Really, it’s a snap. There’s no fighting with the word processor just to get it to stop doing unwanted crap, and to do what I need it to do. If you do need automation, it has a very simple macro system that duplicates every menu item. If you need more, it has simple programming features, and if you need even more, you can drop into Perl. All it does is convert the selected text to a table, and then apply a special style to the top row of the table. Then it selects the entire table for further customization. It saves time in a document with a lot of text that needs to be changed into tables. All it does is set the zoom; it sets it to be the same size as paper would be if I held a sheet in front of the screen, without my having to actually do that and eyeball it. Whenever I find myself doing the same thing over and over, I just list the menu items I’m doing and I have the macro right there. That said, I can’t overstate that you never need to know this: Nisus is well-designed even without all of the macro stuff. I recommend downloading the demo to see if it fits your work style! Note that I assume Word has improved since I last bought a copy; this is not a comparison between today’s Word: since buying Nisus in February of 2008, I have never felt a need to purchase Word. Converting directly from Word also works fine. I’ve done that for some older documents that I don’t want to deal with updating, but just want in Nisus so that it’s easier to put it online. It also supports exporting to ePub, but I haven’t experimented much with this other than to verify that it works. “Of course, a lot of this kind of stuff is old hat today, but it was new and exciting in 1989.” ClarisWorks was easy to use, produced great documents, and was the first truly multi-media presentation tool I used. I continued using it (as AppleWorks) long after it was discontinued, because nothing beat it for ease of writing and ease of drawing. FullWrite Professional was a good example of good intentions and poor design. It could create some beautiful documents—if you were willing to type one letter every few seconds, and wait several minutes for screen updates every time a formatting change was made. Articles about programming in Python, Perl, PHP, and whatever else I happen to feel like hacking at. I use Nisus Writer Pro for almost all of my new documents now. It’s a lot easier to use than the other word processors I’ve tried. My Nisus simple HTML publish script now handles floating images and floating text boxes. Lulu is sometimes really annoying. But they usually get the job done. Nisus, on the other hand, is rarely annoying to use and always gets the job done. In Nisus, it is very easy to grab all text of a specific style, and its nearest heading. This makes it easy to make “room description cards” for handing to the players after reading them. Here’s a Nisus Writer macro that makes it a little easier to create encounter tables. The ultimate distraction-free writing app is a typewriter. One of the best writing purchases I’ve made has been the Levenger Ambi Folio. It’s been a near-constant companion when I go out to write. If you’re a writer, you’re a writer everywhere—often trying to write on whatever semi-hard surface is available. The Fisher Space Pen makes that possible. Several months ago I replaced an aging Apple wireless keyboard with a Logitech K760 solar keyboard and an iwerkz portable folding keyboard. Both of these bluetooth keyboards do great in their intended purpose. Thanks for the great article on Nisus products. We've been using it for years, fantastic product. We're having some problems designing a book using Nisus Writer Pro. Primarily, the photos lose quality when we reduce and then import them. Do you, or do you know, someone who can assist us designing this book, in a professional manner? I don’t know of anyone offhand. If you want it done in Nisus, ask on the Nisus forums. I wouldn’t be surprised if someone there does consulting of that sort. Also, consider that you don’t need to reduce them before you import them. I could be wrong, but I’m pretty sure Nisus does not reduce image quality after import; if you insert a huge image, it will remain huge. My rule of thumb is (a) 300 dpi for covers, 200 dpi internally, and (b) save in PNG, not JPG. It will depend on your images and your printer requirements, of course. Nisus Writer Pro 2.0 last modified March 6th, 2013.